ACME Tools has a $200 off sale on the Nova Voyager DVR 18 In. 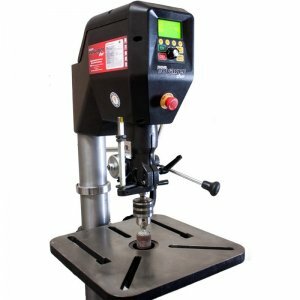 Drill Press (Model: NOVA-58000T) which brings the price from $1499.99 down to $1299.99 + freight shipping. What makes the Nova unique from other drill presses on the market is that it uses digital technology to control motor speed and much more. Using the on screen display you can dial in specific RPM's for cutting materials or you can let the drill choose the correct speed for you. It even has a digital depth guide that can stop the drill when the correct cutting depth is reached. The $200 saving will cover the cost of the freight shipping and you will still have some money left to buy accessories.